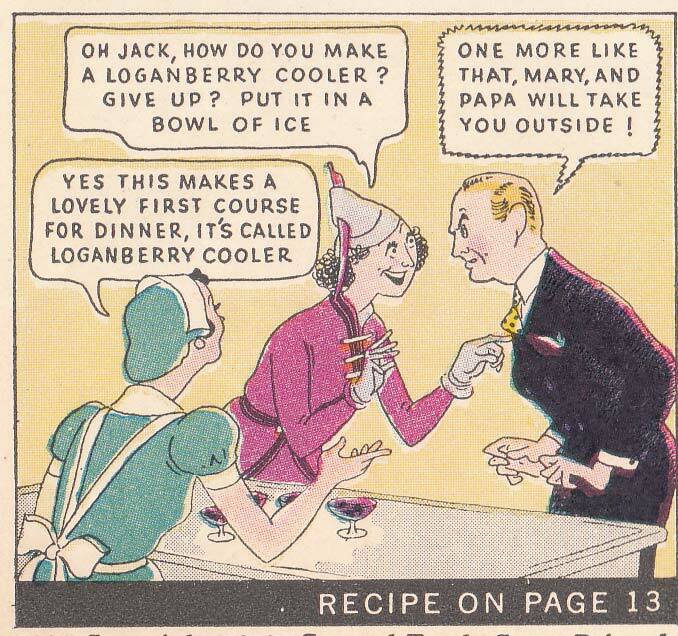 Jell-O sorbet? Now there’s an idea worth thinking about. 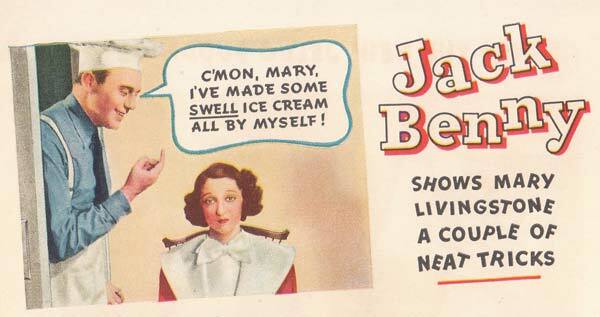 In 1934, Jack Benny was hired as spokesman for Jell-O, and Jell-O in turn became a sponsor of his radio show The Jack Benny Program, with Mary Livingston, Don Wilson, and the Jell-O Orchestra. This was also the same year the now famous J-E-L-L-O jingle was introduced; listen to an original version here. 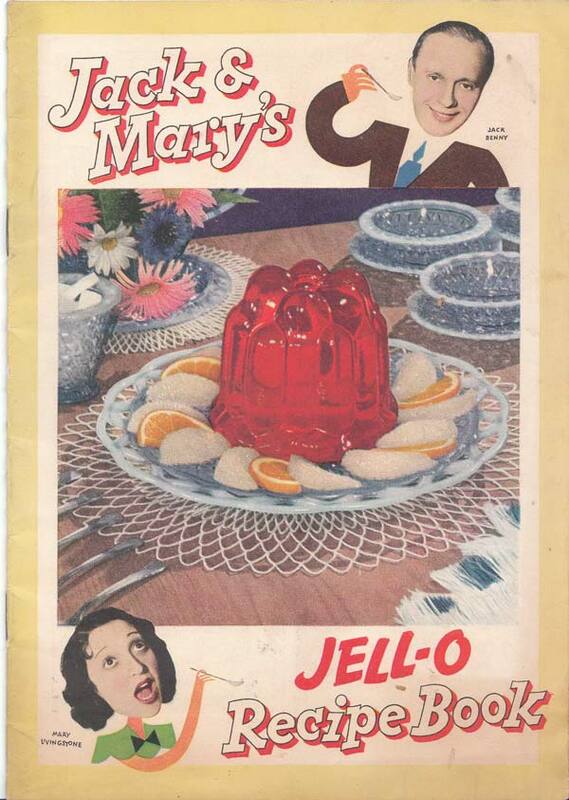 One of the results of this union was Jack & Mary’s Jell-O Recipe Book, published in 1937, and the source of the following recipe for Jell-O Fruit Ice. 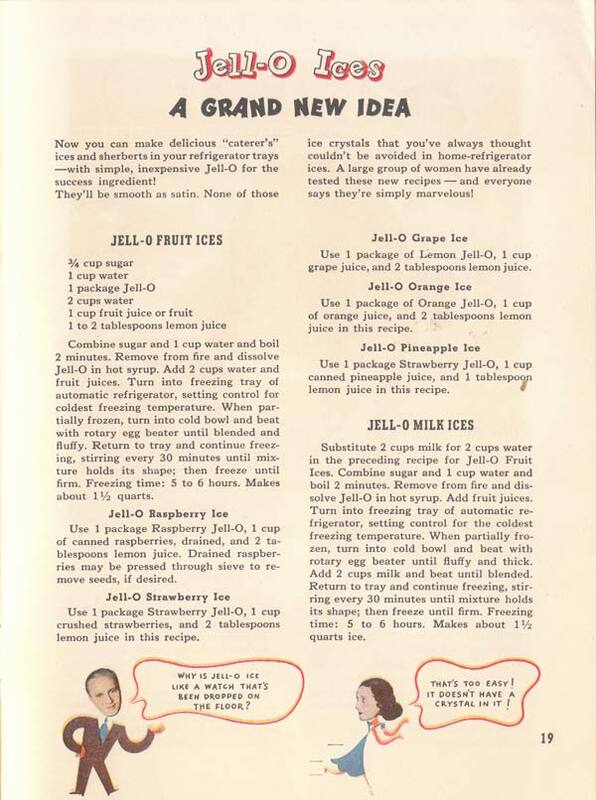 The pamphlet contains some typical Jell-O recipes of the era (prune whip, for one. At what point did we stop loving prunes? ), surrounded by some pretty unfunny and occasionally disturbing cartoons. 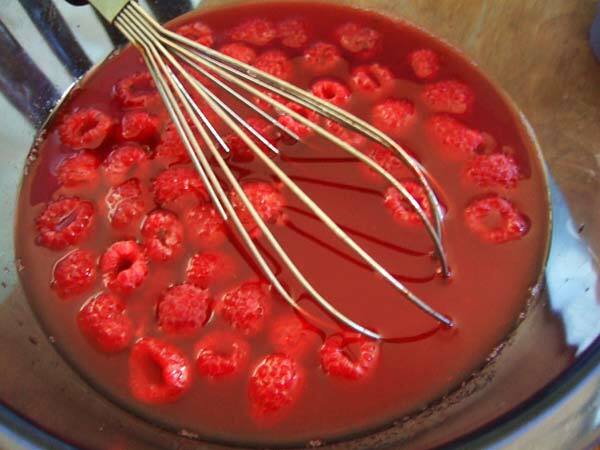 Here’s my variation on the recipe: one package raspberry Jell-O dissolved in one cup boiling water; add one cup cold water, one cup pineapple juice, one tablespoon lemon juice and one cup fresh raspberries. I did not add the extra sugar the recipe recommends. 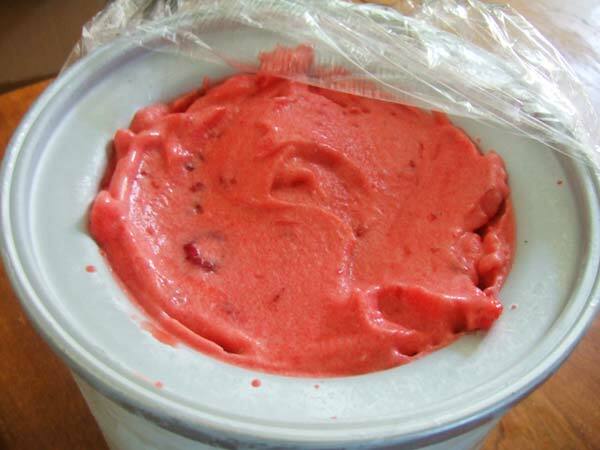 Freezing a fruit ice in 1937 involved a lot of directions concerning a “freezing tray of an automatic refrigerator” and “the cold bowl” and taking things out periodically and whipping them with a “rotary mixer.” I decided the best modern approach would be to use my ice cream maker. Done and done. I poured the Jell-O mixture into the machine and turned it on; I let it spin for about twenty minutes. When I stopped the machine, I was surprised to find that the Jell-O had become pale in color and had a light, fluffy texture. I stashed the mixture in the freezer to harden. Jell-O after a spin in the Ice Cream Maker. A few hours later, I scooped myself some Jell-O ice. 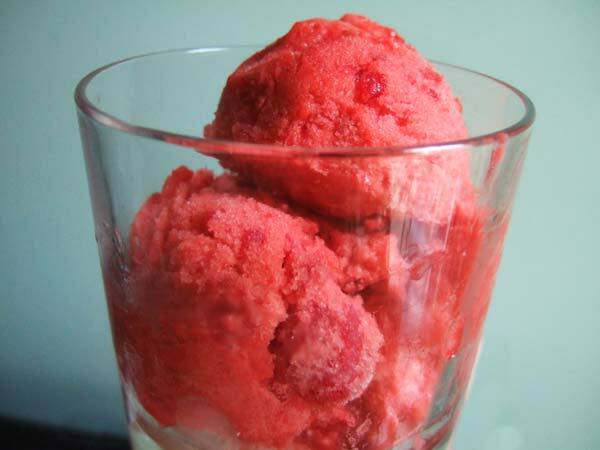 It was pretty good; the texture is not really icey like a sorbet, it’s much more smooth. Like a frozen mousse. It was a cold and refreshing treat, and I ate my whole serving, but I still haven’t quite decided if I like it. I’m going to serve it to some unsuspecting dinner guests tonight. We’ll see what they say. And don’t forget, tomorrow is the Jell-O Mold Competition at the Gowanus Studio Space in Brooklyn. It’s free to attend (there’s a $5 suggested donation) and you’re going to see some amazing Jell-O creations. I was looking for a lemon ice recipe. I found one here: http://www.melskitchencafe.com/2011/06/lemon-ice.html. I goofed and left the mixture in the fridge overnight and it turned into Jello. Considering the recipe I don’t know why I found that to be surprising. Anyway, I love that lemon ice recipe and am looking for more, which is how google brought me here. Thanks for the info. I’ll be giving it a try this week!